Nearly every day I get an email, facebook or instagram comment asking me about flour substitutions. 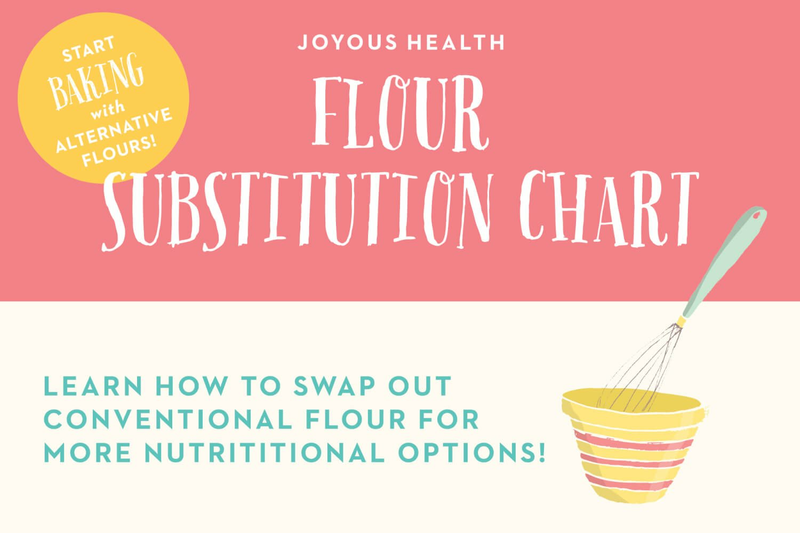 This is totally awesome because this means you’re making healthier subs for white or wheat flours and choosing more nutrient-dense, less food sensitivity provoking flours! My favourite healthy substitute is coconut flour. I know many people have a love/hate relationship with this flour because it certainly has a personality. It absorbs a massive amount of liquid which is why you require so little of it in any given recipe. So I tell you this because while this chart is pretty darn accurate, always remember if you are modifying an original recipe it will be an experiment. Just keep in mind you may need to make other adjustments to a recipe, especially with the gluten-free flours to get them to rise. 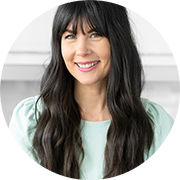 I’ve had a gazillion experiments in my own joyous kitchen so if you are looking for recipes that are already tested, then check out the recipes section of joyous health and my book Joyous Health. I don't see Almond flour listed. Is that a 1:1 ratio? Hi! Saludos desde Costa Rica! I just started reading your blog, and can't stop! Thank you :) Pura Vida! As an example, oat flour is 3T. If a recipe calls for 2 c flour and I wanted to do half/half, would I do 1 c flour and 3 T oat flour... or 1 c flour + 13 T flour and 3 T oat flour? I've seen other conversion charts where this was what they did; limiting the grain to 3T just seems so little! Hi there, I was curious if I were to swap out regular flour for gluten flour would it just be the same straight across? Or would I ned to add some other type of ingredient like xanthan gum? Thank you! Hi again, Joy! Thanks for the info but I am wondering which one of these substitutes makes the best gravy, as in doing a proper roux. I hate what cornstarch does to a gravy, it just is NOT right. Thanks. On the flour substitute chart which flours are gluten free? I used to use Pollyanna and white whole wheat flour, instead of white flour successfully. Was at an Amish store and bought the pollyanna flour. Now it seems like my baked goods are too dense and heavy with Pollyanna flour. Thank you so much for the flour conversion chart. The 3 TBS of oat flour I think is inaccurate. Most conversion charts have it 1:1. I have been doing that for a long time and it has been very accurate. I was looking at your chart regarding conversion of Almond flour and most conversion charts have you at a ratio of 1:1.25. So... maybe I am just reading the chart wrong? And the amount you have on the chart is one cup the amount on the chart? And there should be the additional information of when you change to 'X' flour you also need to add 'Y(set)' of ingredients. Like with Coconut flour adding additional eggs... I think there is still a number of digressions with regard to conversion charts across the board. I am trying to convert our ‘family recipe’ mini meat loaves to keto; as mush as possible. Can I substitute almond or coconut flour for the whole oats? Or do you another suggestion. Thank you! Have you tried coconut, almond, quinoa, brown rice, tigernut, cassava flour? All those are great GF oat flour subs some will have slightly different ratios for substituting than others but it really depends on your recipe too. Any swap you make from a recipe that originally calls for white flour will not be foolproof. It's always a bit of trial and error if you're going to use a gluten-free flour, like the ones you've mentioned. Of those flours, brown rice flour would be the closest in texture but it still can yield a different result. If you don't have a lot of time to experiment, you may be better off getting the right flour for your recipe. I'm not sure as I haven't personally baked with banana flour before so I'm not sure of the texture. What is it similar to? How would i substitute 1 3/4 cups of almond flour to oat flour please? Thank you. What if i were to sub the almond flour for coconut flour? That's a different beast :) Coconut flour is a really tough flour to make subs with unless you have become super familiar with using it and can just tell when you've got the right texture. If you have a recipe you're thinking of, I can take a look and give you a suggestion. Are you asking about these cookies? https://www.joyoushealth.com/20783-blog-chewy-chocolate-chip-tahini-cookies-with-video The reason I ask is that because there are no eggs in this recipe it may be tough to get everything to stick really well. You'd have better luck swapping to almond flour if you use an egg. Hope that helps! Thankyou so much for the helpful chart! Hi! I'm so glad I found this chart! I wanted to ask if I were to convert from spelt flour to oat flour. Is it 1:1? Thank you! Yes, that would be a good ratio. I haven't done it myself but knowing both flours pretty well I would consider it a 1:1 ratio. Good luck!